Philip Elmer-Dewitt published a table from Piper Jaffray’s Gene Munster which has some interesting details. Munster has taken a four year “tech sector” view of value creation (and destruction) and tried to see if there is a bound on the value Apple can continue to capture. This “share of value” is one of many approaches to bounding an opportunity. You could consider “share of wallet” by measuring disposable income, or “share of eyeballs” by measuring screen time available or even “share of GDP”. 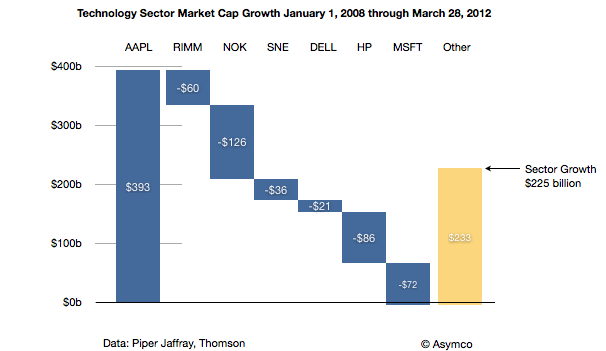 Seen in this context, Apple generated nearly as much value as RIM, Nokia, Sony, Dell, HP and Microsoft destroyed. The rest of the sector generated $233 billion of value but if it were not for Apple, the tech sector would have declined by $168 billion. As a result, Apple went from being 5.6% of the value of the sector to being nearly 17%. The argument goes that its share of value could still increase further even if the overall sector does not. At 30% of current total value, Apple would be valued above $1 trillion. My observation is that the conservation of value exhibited in this data is not the entire story. What is gained by Apple should be more than what is lost by others. The disruption under way has had victims but the net value created should be more than what they lost. The iPhone and iPad should be competing with non-consumption, bringing new value into the sector from other sectors or from non-productive capital. Perhaps they are and the losses by the cohort arrayed above are incidental, but there is likely to be a blend of competition and new market growth. Perhaps. It’s one more perspective into the puzzle. Growth rates, market sizes, technology improvements, brand and satisfaction analysis as well as jobs to be done are all offering perspective views. I would say there is consistency in the data but they should all be weighed with vigilance. Market cap is the perceived net present value of all future cash flows discounted to the present for a publicly traded company and hence defines the value created by the firm. It’s measured by markets so there is room for error but it’s the best measure available and has historically been accurate over long periods.